It’s always a joy to watch DVDs of tall ships and recently Kathy and I broached the rum cask to sit back and enjoy James Craig Sails Again. The 92-minute video is the story of the restoration of James Craig – an incredible example of dedication and Aussie grit. A three masted barque, James Craig was built as the Clan Macleod in 1874. Her maiden voyage was to Peru and she had a busy working life, carrying cargo all over the world, rounding Cape Horn 23 times! In 1900 she was purchased by a Mr J J Craig from New Zealand and used as a general cargo carrier on trans-Tasman trade routes. In 1905 she was renamed James Craig. By 1911 however, increasing competition from steam ships forced many sailing ships out of business. James Craig was stripped and used as a copra hulk in New Guinea. When the First World War broke out a shortage of cargo ships brought the chance for a new life to the old girl. She was towed to Sydney for re-fitting – and work. However this was short lived. In 1925 she was reduced to a coal hulk at the remote Recherche Bay in Tasmania, then abandoned when she broke her moorings in a storm and became beached. 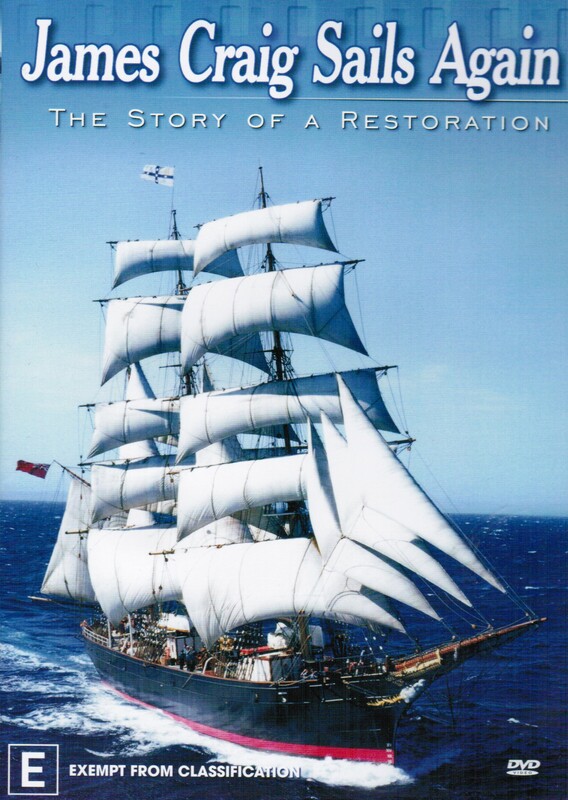 In early 1972 a young Sydney-based maritime museum in search of a tall ship located her derelict rusting iron hull. For almost 30 years a small group of volunteers dedicated themselves to the heroic task of saving the ship; refloating the hull, towing it first to Hobart, then Sydney where restoration commenced. 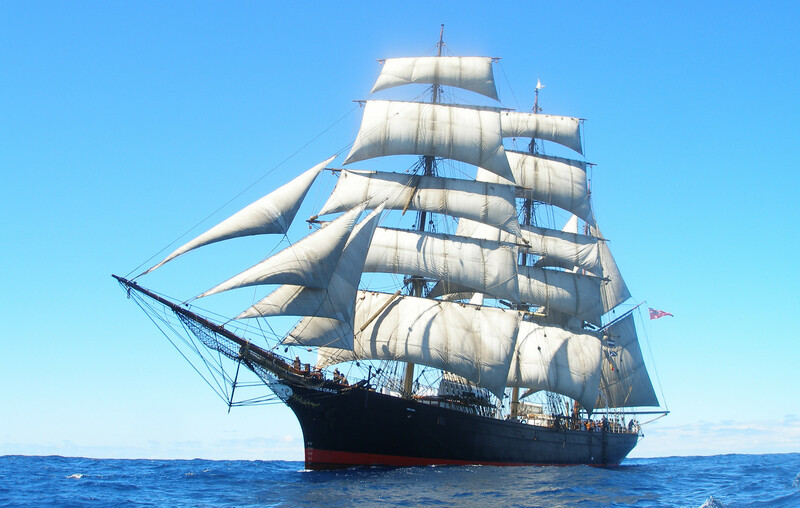 Finally, incredibly, the story has a happy ending when off Sydney Heads in February 2001 she hoisted all 21 sails for the first time in nearly 80 years. Today, as pride of the Sydney Heritage Fleet, she provides a unique connection with the days of sail and is the only operational barque in the world which regularly carries members of the general public to sea. At the International Fleet Review in Sydney tomorrow James Craig will of course be out on the harbour. As well as wishing the Royal Australian Navy a very happy birthday I think we should all raise our glasses to one heck of a restoration! The DVD is available to purchase for A$10 plus p&p. Enquires to info@shf.au Note: outside Australia you’ll need a multi-region player. ← Huzzah: A Toast to Britannia! As a Craig myself it is nice to see a tall ship Carrying the name. Nice one Julian. We spent the day out on James Craig today for the International Fleet Review – what a great spectacle – what a great town we live in – what a wonderful day!! That is an amazing restoration i am envious of all that sail in her. It’s great to see a beautiful tall ship brought back to life.